There are almost 10,000 taste buds located in our mouths, which can distinguish five different types of flavors: sweet, salty, sour, bitter and unami. We are all familiar with the tastes of sweet, salty, sour and bitter, but, what is unami? Unami receptors pick up the taste of glutanic acid salts such as MSG. 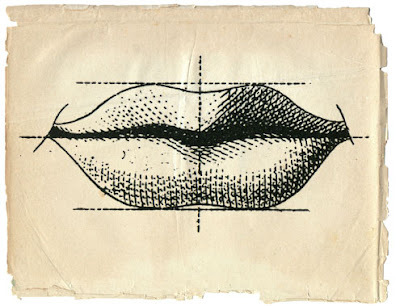 The sense of taste is the weakest of all our senses and depends in part on the sense of smell. Evident by when we have a cold, and can't taste our food. We were quite well nourished during our stay in British Columbia. Close to the hotel we had a lovely farmers market on Saturday mornings. 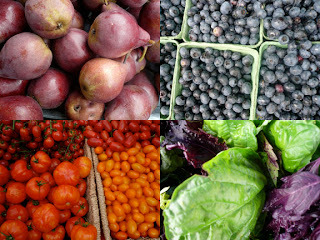 The market had all sort of delights which we would bring back to the kitchen in our hotel room and create feasts with. 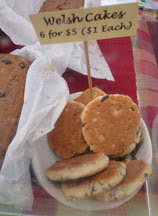 The three of us are still yearning for those yummy welsh cakes we picked up one morning. There was even an accordion player at the market who played a lovely Argentine tango for me. It was great to see plenty of Organic Certified produce as well as many farmers using the biodynamic method of growing and tending the earth. The Public Market at Granville Island was another wonderous place to buy groceries, although we only found one Organic vendor. There were stalls with pasta, bread, pastries galore, fudge, and flowers...all FRESH. We also purchased Canadian maple products and some treacle for Eve. Besides cooking regular meals we ate out quite a bit, meeting with many of the other production artists from Rainmaker after their arduous workday. 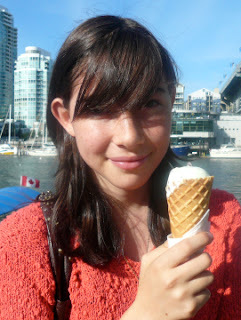 Eve and I liked to get homemade gelato after taking the ferry over to Granville Island, YUM!